I have my Weekly Holiday card to share with you today! This card is absolutely wonderful! I love how the distress oxide inks blended so well. Since I just got 24 of the Distress Ink minis within the last 3 months, I probably shouldn't go trying more new things! LOL! Oh my goshie!!!! This is awesomeness for sure Theresa!!!! I soooooo love your card. It is so beautiful!!! Loving the colors and that Oxides you used!!!! WOWZERS!!!!!!!!!! Oh, I meant to tell you, I fixed it so you can watch the video on my blog. 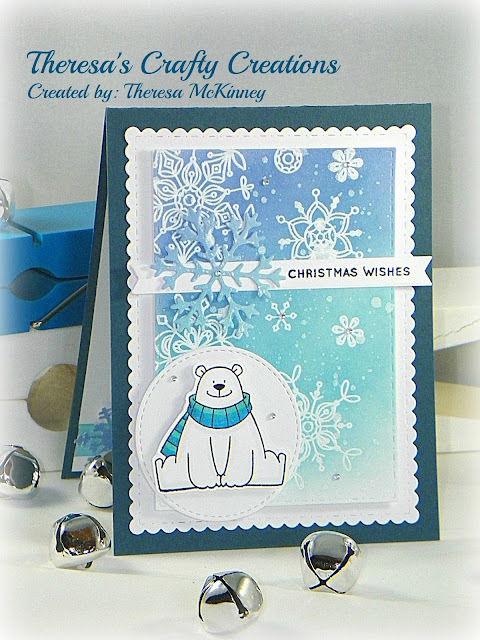 I love the Polar Bear image and snowflake background! Beautiful! Love! I really wanna try the oxides! I have a number of regular min distress inks and am not all that jazzed with them, maybe it's just the size of the pad. But these oxides sound waaay better! Cute card as always!! Beautiful card!!! I love the adorable polar bear image and the gorgeous colors!! I LOVE this card!!! Have a great day. Theresa this is a beautiful card!!!! I absolutely LOVE that background. Those oxides look like they are amazing. I need to get some eventually. .. when I can afford them lol. Hope your shelving works for your stamps! Thanks for linking up in our Funday Friday challenge this week! Wow! Amazing card Theresa!! ❤️❤️❤️ the background, awesome job on the distressing, looks amazing! Polar bear is too cute! Thanks for joking us this week at Die Cuttin' Divas this week. Gorgeous! Love the colors. Blue always reminds me of winter. Your card is stunning! Thanks so much for joining Fun~day Friday at Jo's Scrap Shack. WOW!!! I am in love with this card!! It's amazing!! Your background is fabulous!!! So glad you're enjoying your inks. I bought two to see what I thought and what I think is that I need more!! I have heard, but haven't researched these new inks, but have heard good things about them. Oh,I love this card!! You've used the DOX Inks so gorgeously! Gotta play with mine more now ;) Hope your shelf works out! Can't wait to see it! This is such a sweet card! I love that polar bear and your inking looks amazing! Love those colors! WOW, WOW, WOW! What a beautiful card! So breathtaking! I just love it! Sooo beautiful and that bear so cute! I am waiting for my oxides to come as well as some Gina Marie dies... this is just the prettiest... had to go look at it again! WOW! I love this card! I've been putting off getting the Oxide Inks, but after seeing how beautiful your card turned out, I'm going to have to buy some for sure!